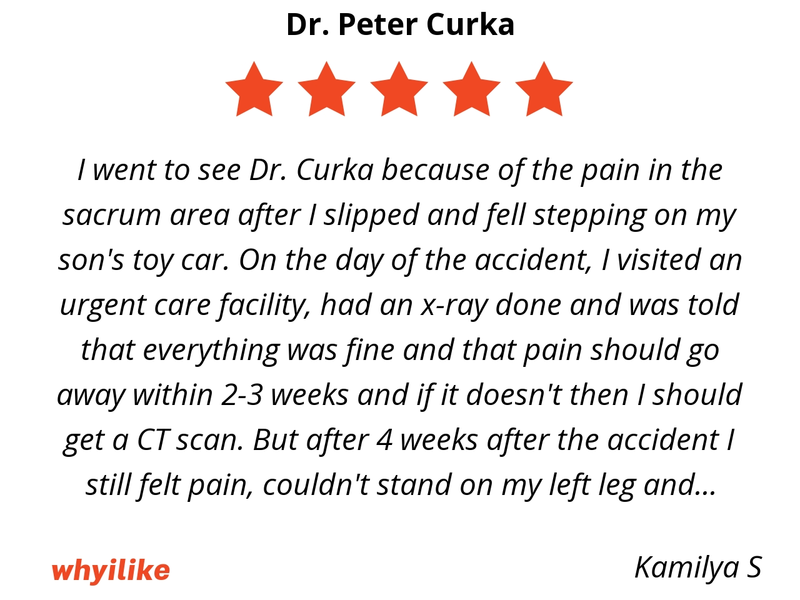 I went to see Dr. Curka because of the pain in the sacrum area after I slipped and fell stepping on my son's toy car. On the day of the accident, I visited an urgent care facility, had an x-ray done and was told that everything was fine and that pain should go away within 2-3 weeks and if it doesn't then I should get a CT scan. But after 4 weeks after the accident I still felt pain, couldn't stand on my left leg and couldn't do sit-ups. So I decided to try an osteopathic treatment. And after my first session, I couldn't believe it, but my pain was gone completely. I've had several more sessions with Dr. Curka and he worked on my back and neck muscles and I feel so much better overall. I am so glad that I found Dr. Curka. I have some issues from a fall I had on the job a few years ago. I find Dr. Curka's work very helpful with this. I just tell him where I am having discomfort and he takes it from there. I am always amazed at the precision, deftness, and wholistic nature of the way he works on the body. I feel much more integrated after a session with him. I have a job that is physically demanding and am better able to handle it with this work. Extremely knowledgeable, honest, and qualified. I have been experiencing pain in my shoulder, neck, back and wrist (I'm a very healthy 25yo), and a session with Dr Curka gave me physical relief and a better understanding of why I'm feeling pain (mental and emotional stress). After being injured in an automobile accident, I sought out an osteopathic doctor. Dr. Curka listened, evaluated, explained the treatment, and answered all of my questions. He made recommendations throughout my treatment. The pain from my injury was better after each visit! 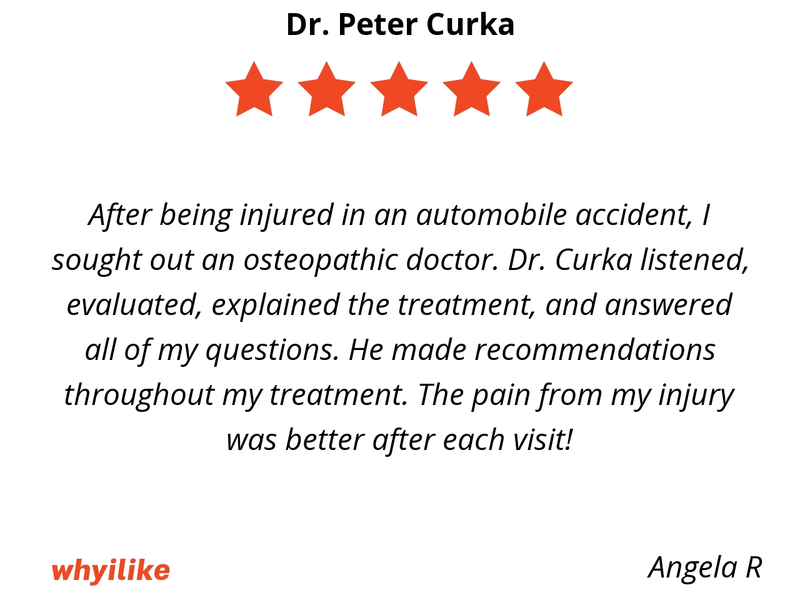 I am really impressed with Dr. Curka’s work as an osteopathic doctor. His treatment is gentle, thorough, and really realigns. I have had chronic hip and back pain for months. After seeing Dr. Curka two/three times I’ve started feeling better and I was finally able to get back into working out. So far, I have continued to improve after every treatment. He is always very helpful and available when needed. 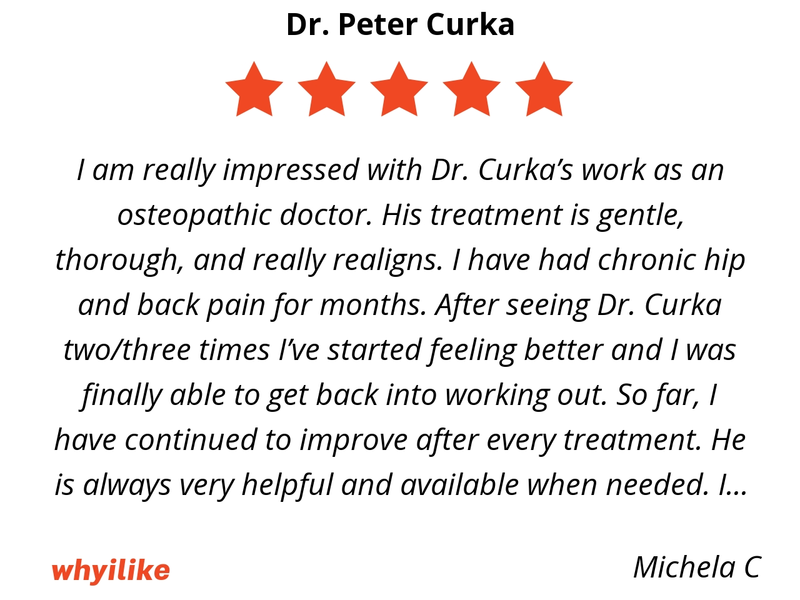 I highly recommend anyone with chronic back issues to seek treatment from Dr. Curka. 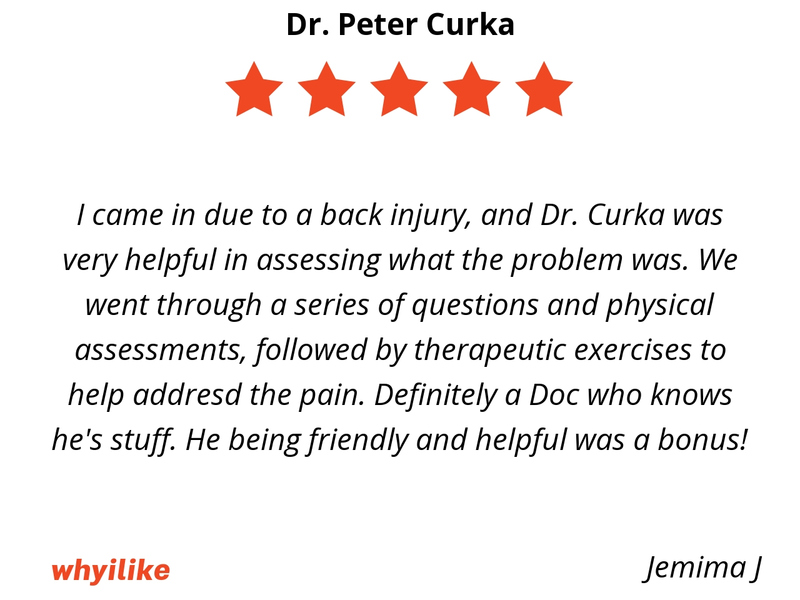 I came in due to a back injury, and Dr. Curka was very helpful in assessing what the problem was. We went through a series of questions and physical assessments, followed by therapeutic exercises to help addresd the pain. Definitely a Doc who knows he's stuff. He being friendly and helpful was a bonus! Dr. Curka alleviates my pain through gentle OMM and muscle energy techniques. He's available when needed and I always leave feeling better. I had hip pain on and off for 3 yrs. I had always suspected it was related to my pregnancy. 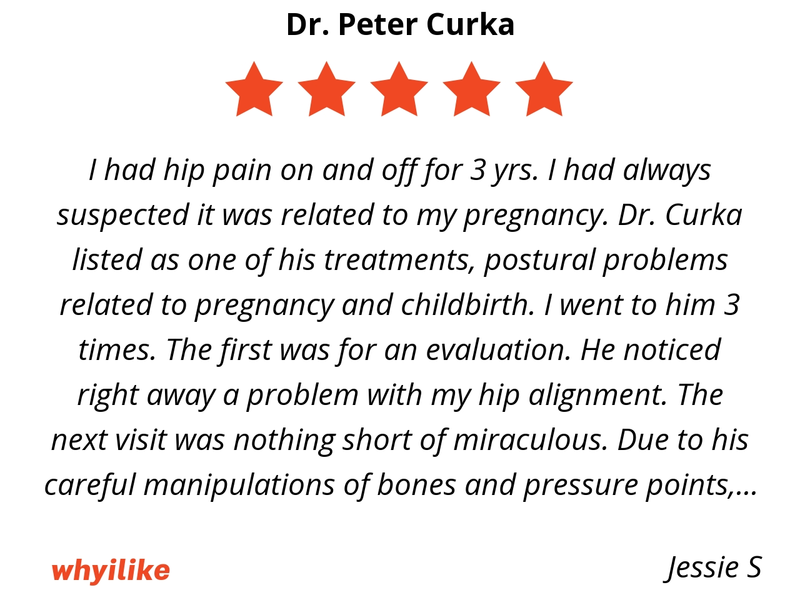 Dr. Curka listed as one of his treatments, postural problems related to pregnancy and childbirth. I went to him 3 times. The first was for an evaluation. He noticed right away a problem with my hip alignment. The next visit was nothing short of miraculous. Due to his careful manipulations of bones and pressure points, I felt a great release of pain. I continued to improve and was able to exercise more due to the lain alleviation. I went one last time and my posture was much more balanced. I would highly recommend his services. You will be much happier when you are pain free.